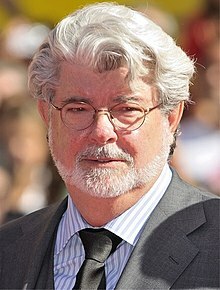 George Walton Lucas, Jr. (born May 14, 1944) is an American film producer, screenwriter, director, an entrepreneur. He foondit Lucasfilm Leemitit an led the company as chairman an chief executive afore sellin it tae The Walt Disney Company on October 30, 2012. He is baist kent as the creator o the space opera franchise Star Wars an the archaeologist-adventurer character Indiana Jones. Lucas is ane o the American film industry's maist successful filmmakers financially. ↑ 1.0 1.1 "George Lucas". Forbes. September 2012. Retrieved September 28, 2012. ↑ Breaking News: Disney Acquires Lucasfilm for $4.05 Billion - STAR WARS: Episode 7 in 2015! This page wis last eeditit on 13 Mey 2018, at 01:03.